The 2nd annual NFL Honors was an awards show presented by the National Football League to salute the best players and plays from the 2012 NFL season. The event was held at the Mahalia Jackson Theater in New Orleans, Louisiana on February 2, 2013 and was hosted by Alec Baldwin. The show aired on CBS and recorded a 0.9 rating with 3.8 million viewers. 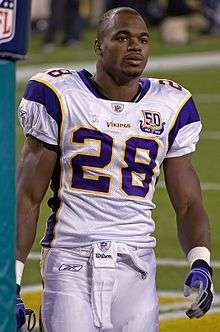 Minnesota Vikings running back Adrian Peterson won four awards, the most of any player. Baldwin's opening monologue, in which he roasted the NFL's biggest stars, was praised. ↑ "The Soul Rebels: House Band for NFL Honors Super Bowl Event". JamBase. Retrieved January 24, 2012. ↑ "Alec Baldwin to host '2nd Annual NFL Honors' Super Bowl Eve". NFL.com. January 8, 2013. Retrieved January 20, 2013. ↑ Jeff Briggs (January 8, 2013). "Alec Baldwin will host 2nd NFL Honors event". SB Nation. Retrieved January 20, 2013. ↑ Amanda Kondolojy (February 3, 2013). "TV Ratings Saturday: 'Cops' Beats '48 Hours' & 'NFL Honors' for #1 Spot on Slow Pre-Super Bowl Saturday". TV by the Numbers. Zap 2 it. Retrieved May 10, 2013. ↑ Dan Hanzus (February 2, 2013). "Alec Baldwin should host 'NFL Honors' every year". NFL.com. Retrieved February 2, 2013. ↑ Hanzus, Dan (February 2, 2013). "Adrian Peterson MVP after dominant season on Vikings". NFL.com. Retrieved February 2, 2013. ↑ Milner, Barry (February 2, 2013). "Colts interim coach Arians wins top honors". Yahoo! Sports. Retrieved February 2, 2013. ↑ "Adrian Peterson tabbed AP Offensive Player of the Year". NFL.com. February 2, 2013. Retrieved February 2, 2013. ↑ Rosenthal, Gregg (February 2, 2013). "J.J. Watt near unanimous Defensive Player of the Year". NFL.com. Retrieved February 2, 2013. ↑ "Russell Wilson named 2012 NFL Rookie of the Year". Seahawks.com. February 2, 2013. Retrieved February 3, 2013. ↑ Wilner, Barry (February 2, 2013). "Griffin beats Luck, Wilson". Yahoo! Sports. Retrieved February 2, 2013. ↑ Sessler, Marc (February 2, 2013). "Luke Kuechly wins Defensive Rookie of the Year honors". NFL.com. Retrieved February 2, 2013. ↑ Aaron Wilson (February 2, 2013). "Torrey Smith wins NFL's Never Say Never Moment of the Year". Ravens Insider. Baltimore Sun. Retrieved February 2, 2013. ↑ Desimone, Dylan (February 2, 2013). "Adrian Peterson wins 2012 fantasy POTY". SB Nation. Retrieved February 2, 2013. ↑ Joe Reedy (February 1, 2013). "St. Xavier's Steve Specht receives national award". Cincinnati.com. Retrieved February 2, 2013. ↑ Alicia Jessop (February 2, 2013). "Dallas Cowboys' Jason Witten Wins the Walter Payton NFL Man of the Year Award for his Work to End Domestic Violence". Forbes. Retrieved February 2, 2013. ↑ Hanzus, Dan (February 2, 2013). "Peyton Manning wins Comeback Player of the Year". Around the League. NFL.com. Retrieved February 2, 2013. 1 2 Alicia Jessop (February 2, 2013). "NFL Honors Highlights the NFL's Award-Winning Players and Partnerships". Forbes. Retrieved February 2, 2013. ↑ "Ray Rice's Fourth-And-29 Conversion Named Bridgestone Play of the Year at "2nd Annual NFL Honors"". NFL Communications. February 2, 2013. Retrieved February 2, 2013. ↑ "San Francisco 49ers QB Colin Kaepernick Wins "Greatness on the Road" Award Presented by Courtyard at "2nd Annual NFL Honors"". Marriott. February 4, 2013. Retrieved February 4, 2013. ↑ Mayer, Larry (February 2, 2013). "Tillman presented with Salute to Service Award". Chicago Bears. Retrieved February 2, 2013.